Immune Force is a Botanical Remedy of Herbs and Oils designed to Penetrate and Support your Liver for its Optimal Natural Detoxification Process and Replenish Body’s Reserves for Clear Liver and Brain Communication. Unparalleled Immune Support -- This is the strongest overall health, Immune System and Liver Support Supplement we have ever made available. Unleash the Force of your Immune System with a new scientific approach in an unprecedented liposomal delivery mechanism of Alcohol, Oils and Herbs in a soft gel capsule. Increase in mental clarity, emotional stability and overall nervous system wellbeing. If a healthy Immune System means a healthy body, then most of us have never fully experienced a healthy Immune System. Clinically studied, powerful Mushrooms and Chinese herbs are used along with high potency and immune boosting oils, to provide a new type of vitality directly to your cells. This combination clears mucous from congested tissue, improves circulation and delivers nutrients to penetrate the otherwise unreachable tissue and cells. When this happens, the body can begin a deep healing process ridding itself of pathogens. IMMUNE FORCE is specifically designed to interact with the Liver-Brain pathway in order to rebalance the natural force of your Immune System. When your Liver is congested by stress, infections and toxins, it loses the capacity to provide healthy blood and nutrition to your brain and body. Not only will your brain not get fed properly, it is directly fed toxicity. Where your brain is expecting to absorb friendly nutrients for a healthy environment, it is fed unbalanced blood creating a hostile environment. Your brain, as the messenger between all systems, begins to store toxic debris. This storage causes the brain to lose its ability to maintain homeostasis and a healthy immune system. In time, the body begins attacking its own toxic cells which leads to autoimmune disorders. 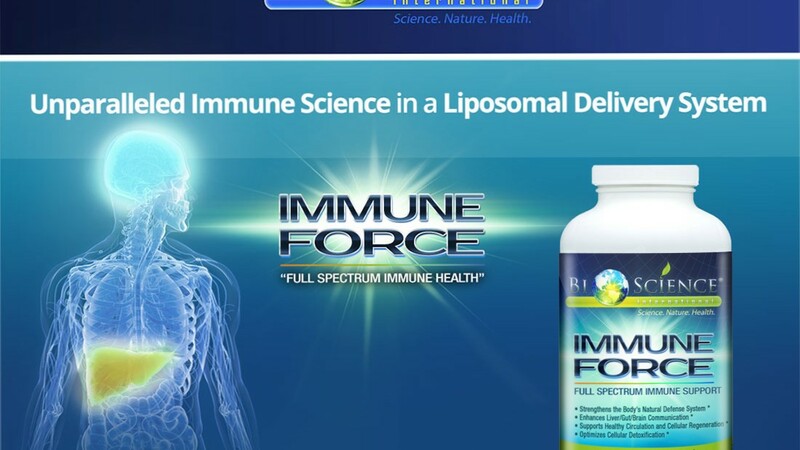 IMMUNE FORCE comes to the rescue by heating and penetrating the congested liver pathways to remove inflammation, clear bile ducts of trapped minerals, toxins and viruses and help restore the liver, brain and immune system to unprecedented levels of force. EXCELLENT TO HAVE IN THE HOUSE FOR COLD AND FLU SEASON! Immune Force works quickly to both enhance and strengthen micro capillary circulation and to lower inflammation. It also has an intense cumulative effect on building your immune system and rebalancing the cells -- for long-term improvement and healing. Therapeutic purposes: 2-4 bottles per month. Other ingredients: Sunflower lecithin, Bovine gelatin, Ascorbic acid, Ethyl alcohol. More Clients Feedback and Reviews: We are working on to restore the link.